Mahindra, Indian automobile giant is planning to launch the eco-friendly Mahindra EV on the occasion of World Environment Day. As of now, only 5 units of Verito EV is manufactured and the same would be launched on June 5 (today) on account of World Environment Day. The manufactured EV units would be supplied to Bharat Heavy Electricals Limited (BHEL). 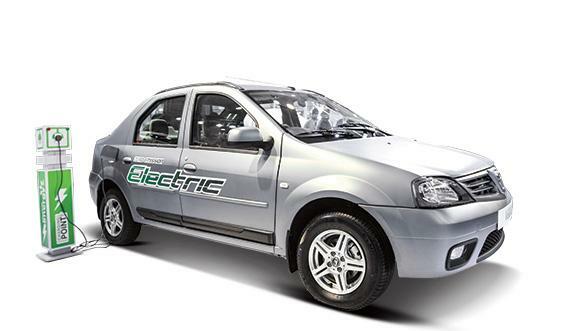 The Verito EV from Mahindra was first showcased in 2012 Delhi Auto Expo. The car is powered by lithium-ion batteries that takes 7 hours to charge completely. When charged fully the car can commute upto a range of 80kms and offers a top speed of 85 Kmph. The car was again showcased in 2014 Delhi Expo which showed some minor styling upgrades. Several times, the car was spotted testing on Indian rides. The exterior features of Mahindra Verito EV are very similar to standard version of Verito. There is no exhaust pipe in this car, and the fuel filler cap has been replaced by charging outlet – as it is an electric car. You can expect the commercial launch of Verito EV in early 2016. According to the company, the car would target the commercial car segment – the segment which offers rentals, self-drive and fleet services. After Mahindra e2o, the Verito EV would be the second electric vehicle from Mahindra.